Booming business for self-employed garment seller Qiao Sheng in Qianqiao town, Anqing, Anhui province, has not only been fattening his bank account by the week, but also enriched his family's dinner table. "I grew up mostly on salted vegetables - made without oil - during my childhood," said Qiao, in his 40s. "Now, as life gets better, I want my children to be better fed, stronger and healthier." Many in town seem to share Qiao's sentiments. Fifteen years ago, Qianqiao had just one pork seller. Today, there are five of them to feed the surging demand for meat. It is one example of how, along with the country's economic growth, changes in diet that started with urbanites have spread to farmers such as Qiao. Each person in the country now consumes 5 percent more meat, 10 percent more milk and 8 percent more cooking oil annually than five years ago, figures from the National Bureau of Statistics have shown. Improvements in diet had already been making an impact. A survey by the Ministry of Health in 2002 showed that the average height of children between the ages of 3 and 18 rose 3.3 cm between 1992 and 2002. The rate of malnutrition among the children dropped by more than half in the same period. However, amid a surge in global food prices, a number of fingers have pointed to changes in Asian diets including those in China as the culprit for the food price hikes. A number of US economists, for example, have said that a major reason for soaring food prices is the increasing demand for meat and dairy products in China and India, the two most populous countries. Since it takes 7 kg to 8 kg of grain to produce 1 kg of meat, higher meat and dairy consumption is said to require more grain. With Chinese eating more meat, drinking more milk and using more cooking oil, there is also a corresponding spike in demand for feed to produce a growing population of pigs and other livestock, critics have said. Industry publication Biofuels Digest editor Jim Lane said in a report that "an additional 277 million tons of grain would be needed to support China at parity with the US. That would take 68 million acres to grow. "There is not that kind of arable land available anywhere in the world, whether we use grains for renewable energy or not." The logic behind Lane's claim is questionable, experts have pointed out. There is no reason for Asian countries to follow the meat-based diet of the West, they say. 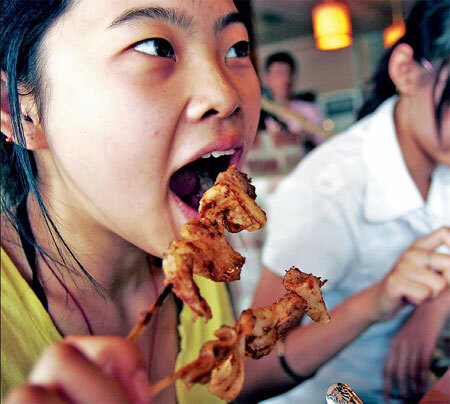 "It is irrational to analyze the diet changes in China based on an American model," said Lu Zhiming, an academic with the Shanghai-based Fudan University. Put simply, Asian countries including China and India are not used to eating the same amount of meat and dairy products as their Western counterparts, consuming limited amounts of grain for feed as a result, Lu said. After all, China is still a net exporter of agricultural produce, he said. The average grain consumption of one American is six times that of a person in India, about 1,076 kg, statistics from the US Department of Agriculture have shown. 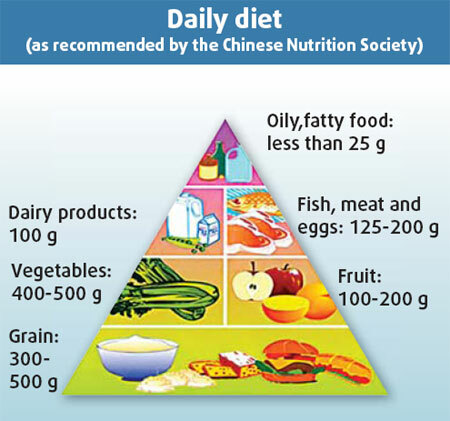 The foods that make up a Chinese diet are varied and do not revolve around meat, said He Xuezhong, chief analyst with the Beijing-based Orient Agribusiness Consultant Ltd, China's sole agriculture consultation company and a subsidiary company under the NASDAQ-listed Xinhua Finance. 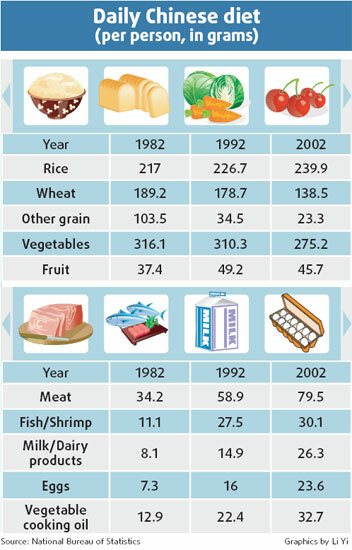 The daily intake of meat, poultry and seafood for each Chinese in 2002 was 109.6 g, or about 40 kg a year, a survey jointly released by the Health Ministry, Science and Technology Ministry and National Bureau of Statistics has shown. Americans remain the biggest meat consumers, with each person eating about 80 kg of meat, fish and poultry a year, statistics from United Nation's Food and Agriculture Organization have shown. Making up about 5 percent of the world's population, those in the US grow and kill close to 10 billion animals a year, more than 15 percent of the world's total, according to US-based Organic Consumers Association. On the other hand, China is feeding more than 22 percent of the world's population on less than 7 percent of arable land available worldwide, Chinese Agriculture Minister Sun Zhengcai said. The figures reflect the contributions China makes to the world, Sun said. In nearly six decades after 1949, China has managed to feed a large population and increase per capita grain production, Sun said. At the same time, the authorities recognize that food supplies remain precarious with the rising demand for food amid improvements in living standards, experts have said. Each person in developed countries now consumes an average of 60 kg of meat, 100 kg of dairy products and 24 kg of cooking oil a year, Chang Qing from the China Agricultural University estimated. Based on consumption patterns in the West and taking into account eating habits of the Chinese, annual meat intake in China will grow by 20 percent to catch up with the West, Chang said. The demand for dairy products could also double. The consumption of cooking oil could also grow by 30 percent from the current 18 kg. The increase in homegrown animal feed will not be able to meet this increase in demand, experts have warned. Last year, the country consumed about 517 million tons of grain, with a 16-million-ton shortage in supply, mainly in corn and soybean, said Nie Zhenbang, head of the State Grain Administration (SGA). The country produced only 9.62 million tons of cooking oil last year, meeting only 42 percent of the 23-million-ton annual demand, SGA figures have shown. Soybean imports tripled in the past three to four years and currently make up 60 to 70 percent of local demand, compared with 20 to 30 percent in 2002, SGA figures showed. Since last year, the authorities have stipulated a series of policies to stabilize food prices and ensure steady grain supplies. It forbids producing ethanol from grain and restricts the export of corn and rice. The State Council also implemented rules last year to boost oil and dairy production. "The central leadership should have a consistent agriculture policy if they want to see long-term effects. Short-term policies won't work," said He Xuezhong from consultancy Oriental Agribusiness Consultant Ltd.
Health authorities and nutritionists have also cautioned many Chinese against taking too much meat and using too much cooking oil. More meat intake does not guarantee better health, they have said. A health survey in 2002 showed that 22.8 percent of Chinese were obese, with that trend showing no sign of abating. More people under the age of 40 are now suffering from diet-related illnesses such as high blood pressure and coronary heart disease. Three years ago, former vice-health minister Wang Longde advocated a new diet revolution - he encouraged Chinese to eat fruit before regular meals, maintain their intake of cereals, eat more vegetables and reduce their consumption of meat and oil. Li Lite, a professor with the China University of Agriculture, made similar proposals at a forum early this year. "Over consumption of meat and edible oil have created time bombs that will hit people's health," he said. Eating less meat and edible oil will reduce the threat of these "time bombs" and cut total grain consumption, Li said.